Before he became Chancellor George Osborne announced that his aim was not just to eliminate the structural deficit and protect the AAA rating but to build a whole ‘new economic model’. So this is the new economic framework for monetary and fiscal policy that we need to ensure that private and public debt are sustainable in the future. The answer is the final part of this new economic model. The economics profession is in broad agreement that the recovery will only be sustainable if it is accompanied by an internal and external rebalancing of our economy: in other words a higher savings rate, more business investment, and rising net exports. The problem for Osborne is that his macroeconomic mix of tight fiscal policy, easy money & weak sterling is not only failing to make progress on the deficit, it is also failing to achieve any sort of ‘rebalancing’. As Citi’s UK economist Michael Saunders told the FT last month, “The rebalancing thing is just clearly not happening”. An earlier TUC economic report reached the same conclusions. Osborne, the Shadow Chancellor, argued that the recovery would ‘only be sustainable’ if it was driven by more ‘business investment and rising net exports’. Yesterday Osborne, the Chancellor, delivered a set of growth forecasts based on what might be termed ‘the old economic model’. 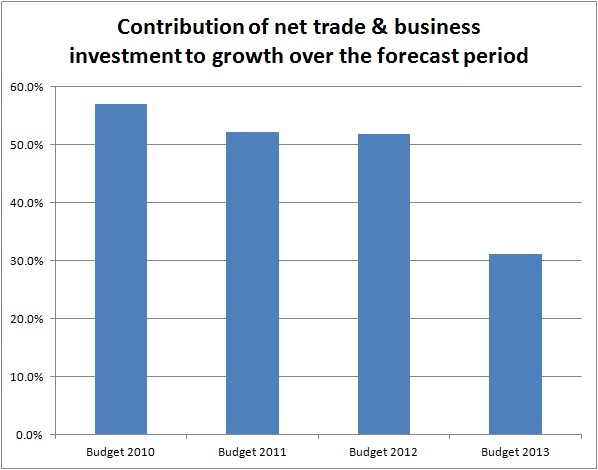 The chart below shows the forecast contribution of business investment and net trade to growth over the forecast period in each of the Chancellor’s four budgets. So, for example, the 2010 forecast was for 2010-2015, whilst the 2013 forecast is for 2012-2017. As can be seen, in the June 2010 Budget, the Chancellor expected 57% of all growth to come from his preferred (and ‘sustainable’) sources of business investment and net trade. By this time last year, that contribution had fallen to around 52%, lower but still more than half of all growth. Yesterday’s forecasts have business investment and net trade contributing only 31% of all growth to 2017. To see how much has changed, it is useful to compare the June 2010 OBR forecast for 2015 to the one made yesterday. Not only has the headline rate of growth for 2015 been slashed from 2.7% to 2.3% but the composition of that growth now looks very different. Three years ago the OBR expected 56% of all growth in 2015 to be from business investment and net trade, in the latest estimate that has fallen to 39%. Three years ago George Osborne argued that “that we cannot go back to the last decade’s debt-fuelled model of growth”. As I listened to his housing market announcements yesterday, I thought “it sounds like he is going to try”. Extraordinarily, data released by the ONS yesterday shows that house prices are now almost back to their pre-crash levels in 2008, despite stagnation in the wider economy. Prices in London have shot up by 5.5 per cent in the last year alone. In other words, the housing bubble remains inflated, and subsidising mortgages based on the presumption of rising prices simply props it up further. The reason first-time buyers and so-called ‘second steppers’ are struggling to afford housing is that prices are so high because rates of new building are so low. The chancellor’s announcement simply perpetuates this cycle, rather than breaking it. High prices, such as in 1988-98 and the mid-00s were associated with households’ financial deficits, and low prices with surpluses. This makes me think that encouraging mortgage lending and raising house prices will increase households’ aggregate financial deficit [and hence possibly lower the government’s deficit]. First, and most preferable but most unlikely, we get strong growth in real incomes as inflation falls back towards 2% and wage growth increases. If that happens consumption growth will be stronger and the economy will grow at a decent pace. Second, and what I think is the most likely outcome – my central ‘forecast’ if you will – household income growth will be weak and the savings ratio will not drop by much. The result will be weak consumption growth and an economy that is growing, but growing slowly – in the order of 1-1.5% a year. In historical terms of recovery from recession this is pretty much a disaster. Third, it is possible that we still get weak income growth but that the savings ratio drops rapidly. In this scenario we’d see faster consumption growth and hence faster overall growth. This however would be accompanied by a big increase in household debt. It might give us 3 – 4 years of decent growth, but at the risk of increasing the financial imbalances that got us into trouble in the first place. I hope for the first outcome, expect the second and worry about the third. My worry today is that George Osborne has essentially given up on rebalancing and is aiming for my third scenario. 4 Responses to Abandoning rebalancing? Starting to believe that all this help to buy plan is meant to achieve is to allow middle class voters to believe that their kids can still buy homes. When in reality in large parts of the south east only a tiny percentage of people can afford it. Continuing the illusion that our economy, and distribution of wealth within it – has not totally failed.